Participants : Ronald Phlypo [Correspondant] , Bertrand Thirion, Gaël Varoquaux. The estimation of functional connectivity structure from functional neuroimaging data is an important step toward understanding the mechanisms of various brain diseases and building relevant biomarkers. Yet, such inferences have to deal with the low signal-to-noise ratio and the paucity of the data. With at our disposal a steadily growing volume of publicly available neuroimaging data, it is however possible to improve the estimation procedures involved in connectome mapping. In this work, we propose a novel learning scheme for functional connectivity based on sparse Gaussian graphical models that aims at minimizing the bias induced by the regularization used in the estimation, by carefully separating the estimation of the model support from the coefficients. Moreover, our strategy makes it possible to include new data with a limited computational cost. 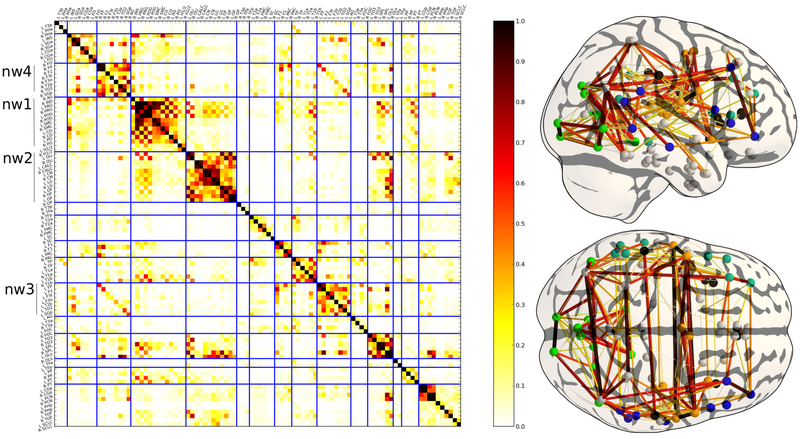 We illustrate the physiological relevance of the learned prior, that can be identified as a functional connectivity atlas, based on an experiment on 46 subjects of the Human Connectome Dataset. Figure 5. Prior on the functional connectivity: the coefficient of the matrix represent the frequency of an edge at each position. This model can be interpreted as a data-driven atlas of brain functional connections. In the current framework, it can easily be updated to take into account more data.